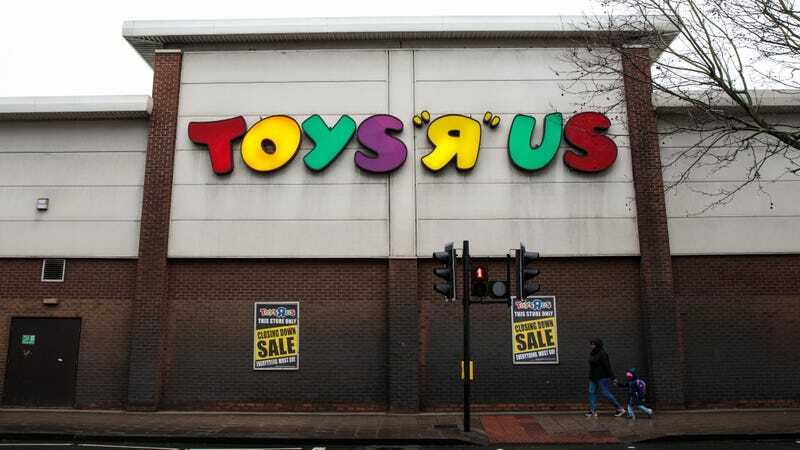 Less than a week after rumors began swirling that mall-based toy retailer Toys R Us would soon go the way of slap bracelets (or, for that matter, the American shopping mall itself), The Washington Post confirms today that the once-massive retail chain is preparing to close the entirety of its 800-plus U.S.-based stores. The company—which has struggled to survive in a world of big box retailers and online marketplaces—filed for bankruptcy six months ago, and is reportedly as much as $8 billion in debt. The consequences for the collapse should be obvious; 33,000 people are expected to lose their jobs as the stores close nationwide. Meanwhile, all of the company’s fabled “Toys R Us kids” will be forced to suddenly grow up, with horrifically rapid results as they advance to their proper ages. The backwards Rs will be spun ‘round the correct way, in the hopes of donating them to local dictionaries. And Geoffrey The Giraffe, the company’s long-time mascot, will presumably be remanded to the custody of the state, to be placed in a zoo somewhere where he’ll inevitably wither, and pine.